Even the greatest men in the Bible had to deal with fear. If you are dealing with fear in your own life, there is good news. God wants to see you overcome that fear. In this message, you’ll gain practical insights to help you trust God and experience His peace and deliverance. 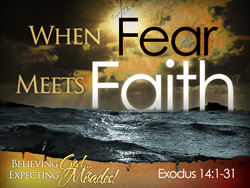 You’ll learn to conquer your fear as you fix your eyes on Jesus and walk by faith and not by sight.